THE NEW STANDARD IN LUXURY & HIGH-POWER PERFORMANCE: The new HotelSpa Notilus series combines the latest in innovative technology, premium materials and breathtaking design to rival top German and American shower brands at the fraction of their cost. With advanced engineering and state-of-the-art features, Notilus showers meet or exceed highest quality and durability standards. They redefine shower luxury by delivering superior performance and functionality unmatched by most other brands. 6 LUXURIOUS SETTINGS PLUS EXTRA-WIDE FLOW COVERAGE: Instantly transform your ordinary shower into a true hotel spa. Enjoy Power Rain, Pulsating Massage, Hydro-Mist and two mixed settings, or use convenient ON/OFF Pause Mode to save water. Giant 4.3" face with high-power click-lever dial delivers extra-wide flow coverage with amazing power and precision. Flexible rub-clean anti-clog jets help prevent the buildup of mineral and calcium deposits for years of consistent clog-free performance. UNMATCHED CONVENIENCE & VERSATILITY: Experience the ultimate in hands-free shower pampering! Angle-adjustable ball joint lets you set desired flow angle for perfect shoulder-to-shoulder flow coverage, while the easy-turn click lever makes changing flow settings effortless. Use handy ON/OFF Pause Mode to instantly turn off and restart water flow when desired. With six settings to choose from, it's ideal for an invigorating shower massage, relaxing spa pampering or fast power-rinsing. TOP QUALITY ALL-IN-ONE SET: The reliable solid brass connection nut with angle-adjustable ball joint will not leak, crack or strip. And the 100% spot-resistant all-surface chrome finish will not fade, scratch or chip. Includes removable 2.5gpm flow regulator, all washers and plumber's tape. Enjoy the eady tool-free installation without a plumber. Mounts on any standard shower arm with just one hand-tighten connection. THE NEW STANDARD IN LUXURY & HIGH-POWER PERFORMANCE: The new HotelSpa Notilus series combines the latest in innovative technology, premium materials and breathtaking design to rival top German and American shower brands at the fraction of their cost. 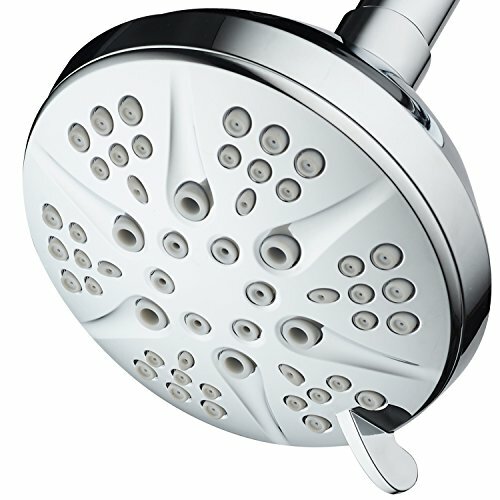 With advanced engineering and state-of-the-art features, Notilus showers meet or exceed highest quality and durability standards. They redefine shower luxury by delivering superior performance and functionality unmatched by most other brands. 6 LUXURIOUS SETTINGS PLUS EXTRA-WIDE FLOW COVERAGE: Instantly transform your ordinary shower into a true hotel spa. Enjoy Power Rain, Pulsating Massage, Hydro-Mist and two mixed settings, or use convenient ON/OFF Pause Mode to save water. Giant 4.3" face with high-power click-lever dial delivers extra-wide flow coverage with amazing power and precision. Flexible rub-clean anti-clog jets help prevent the buildup of mineral and calcium deposits for years of consistent clog-free performance. UNMATCHED CONVENIENCE & VERSATILITY: Experience the ultimate in hands-free shower pampering! Angle-adjustable ball joint lets you set desired flow angle for perfect shoulder-to-shoulder flow coverage, while the easy-turn click lever makes changing flow settings effortless. Use handy ON/OFF Pause Mode to instantly turn off and restart water flow when desired. With six settings to choose from, it's ideal for an invigorating shower massage, relaxing spa pampering or fast power-rinsing. TOP QUALITY ALL-IN-ONE SET: The reliable solid brass connection nut with angle-adjustable ball joint will not leak, crack or strip. And the 100% spot-resistant all-surface chrome finish will not fade, scratch or chip. Includes removable 2.5gpm flow regulator, all washers and plumber's tape. Enjoy the eady tool-free installation without a plumber. Mounts on any standard shower arm with just one hand-tighten connection. AMERICA'S TOP DESIGNER SHOWER BRAND: Why even consider cheap products from unknown sellers with suspicious reviews? Now you can get the genuine HotelSpa Quality directly from the manufacturer with over 29,000 verified positive Amazon seller reviews! Trusted by millions of Americans for unmatched value, performance & reliability, we're one of America's top-rated shower brands. Lifetime warranty on all parts and U.S. Customer Support Team with trained shower experts to help you by phone or email. If you have any questions about this product by HotelSpa, contact us by completing and submitting the form below. If you are looking for a specif part number, please include it with your message.